UPDATE: According to WhatsApp, normal service has been resumed. 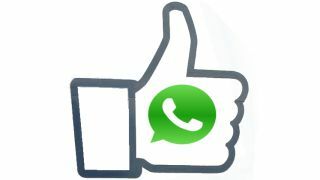 The company tweeted: "WhatsApp service has been restored. We are so sorry for the downtime..."
US$19 billion can buy you a lot of things, but it can't buy you a messaging application that's completely immune to ocassional server issues. Just days after being snapped up by Facebook, WhatsApp fell over on Saturday and, at the time of writing (10pm UK time, 5pm EST, 9am ACT) has been out of commission for over two hours. The company took to Twitter to confirm the service-wide outage, which is its first major issue since December 2013. It wrote: "Sorry [we're] currently experiencing server issues. We hope to be back up and recovered shortly." While it's likely the service will be up and running again before too much longer, it's probably not what Facebook envisioned when it announced one of the largest acquisitions in tech history on Wednesday. As a result of the WhatsApp outage, rival service Telegram Messenger is reporting record registrations and has been unable to cope with the demand. "This is crazy. We're getting 100 new registrations every second. Trying hard to prevent connection issues in Europe," the company tweeted. Analysis: Why did Facebook splash out on WhatsApp?